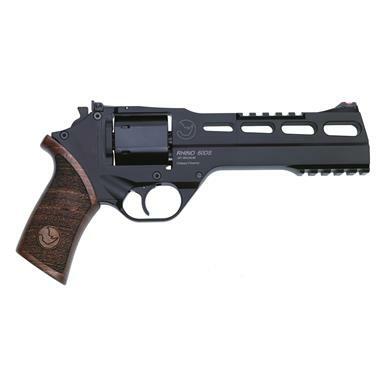 Refusing to be constrained by tradition and previous design limitations, the Rhino moves the revolver 21st Century. Unconventional in appearance and superior by performance, the Rhino fires from the bottom of the cylinder rather than the top. This dramatically reduces muzzle rise and recoil by lowering the axis of the bore almost to the palm of the shooters hand. An aluminum alloy frame and barrel shroud make the Rhino lightweight and easy to carry. The snag-resistant “hammer” is actually a cocking device because of the Rhino’s innovative, completely-enclosed firing mechanism. A cocked indicator is clearly visible to indicate the internal hammer status. Another innovation is the hexagonal cylinder which keeps the revolver’s width to a minimum. Long story short…it's no movie prop. It's the real thing, with real innovations that make it a hoot to shoot.